The Field Museum of Natural History (variously known as the Field Colombian Museum and the Chicago Museum of Natural History) was founded by wealthy philanthropists in the wake of the 1893 World’s Columbian Exposition in Chicago. It has since expanded into one of the largest natural history museums in the world, a destination attraction and a hub for ongoing research. 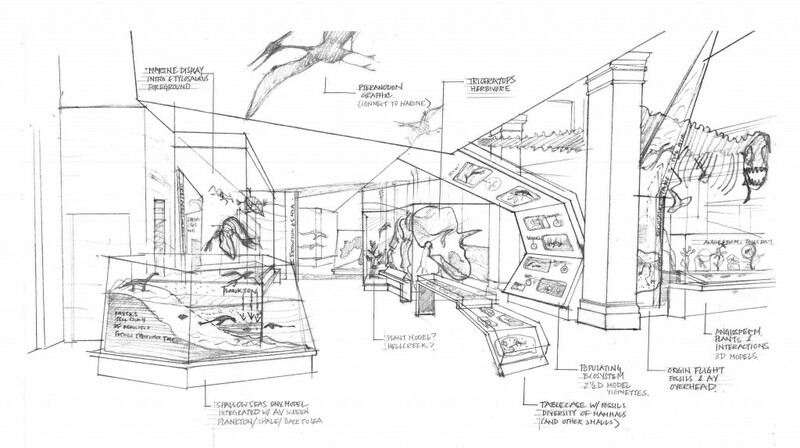 What follows is a summary of the historic paleontology exhibits at the Field Museum – when and how they expanded and changed, when major specimens were added, and who spearheaded these efforts. As with my previous overviews of fossil exhibits at AMNH and NMNH, please note that I will not be discussing field expeditions or research by museum staff in any detail, as these topics are well-explored elsewhere (see Paul Brinkman’s extensive work, for starters). My primary interest here is in the public-facing exhibits, and the people who created them. The World’s Columbian Exposition was held in Chicago in 1893, principally as a celebration of the 400th anniversary of Christopher Columbus’s arrival in the Americas. Lasting six months and attended by 27 million people, the Exposition was monumental in size and scope. 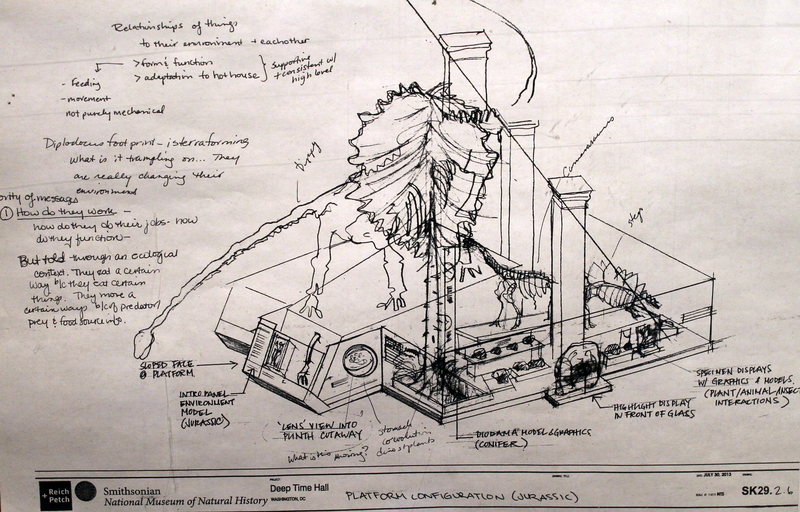 Years before it even opened, there was talk about using the Exposition displays to seed a new museum, which would rival the great natural history museums in New York and Washington, DC. Eager to establish an enduring cultural attraction in their city, a group of wealthy Chicagoans – including Marshall Field, who donated an unprecedented $1 million – contributed the necessary funds to buy up many of the Exposition’s exhibits and found the Field Columbian Museum. As the largest and most elegant of the 200 temporary buildings constructed for the Exposition, the Palace of Fine Arts became the Field Museum’s home. Frederick Skiff served as the first director, acting as an intermediary between the board of trustees and the new curatorial staff, who would manage the collections and assemble the exhibits. Skiff hired geologist Oliver Farrington to curate the earth science collections, a diverse mix of minerals, gems, meteorites, fossils, and fabricated displays purchased from the Henry Ward Natural Sciences Establishment. With thousands of specimens to catalog, Farrington was soon overwhelmed. He repeatedly asked Skiff to hire a paleontology specialist to support him, but the board (composed of the businessmen who founded the museum) was uninterested in paying more salaries or acquiring new specimens. 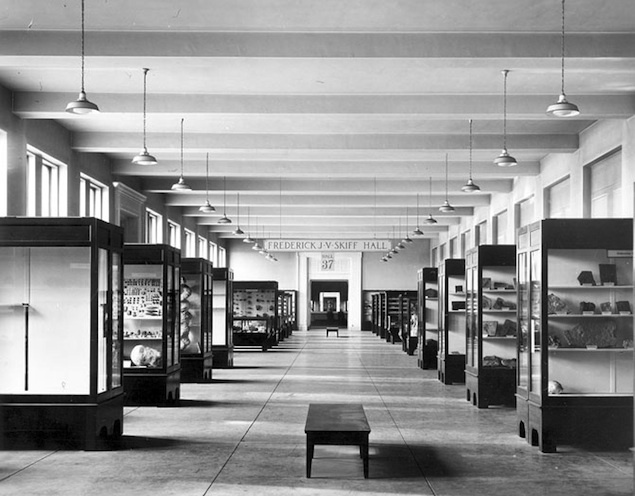 The model icthyosaur and thousands of fossils in cases were among the specimens purchased from the Ward Natural Sciences Establishment after the World’s Columbian Exposition. Image courtesy of the Field Museum Photo Archives. 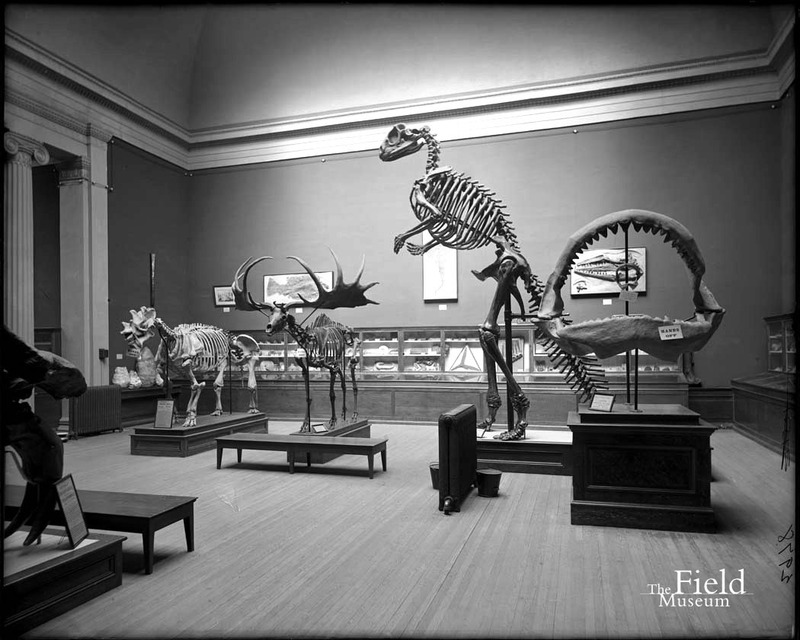 When the Field Columbian Museum opened on June 2nd, 1894, most the 5,000-piece fossil collection was on public display. 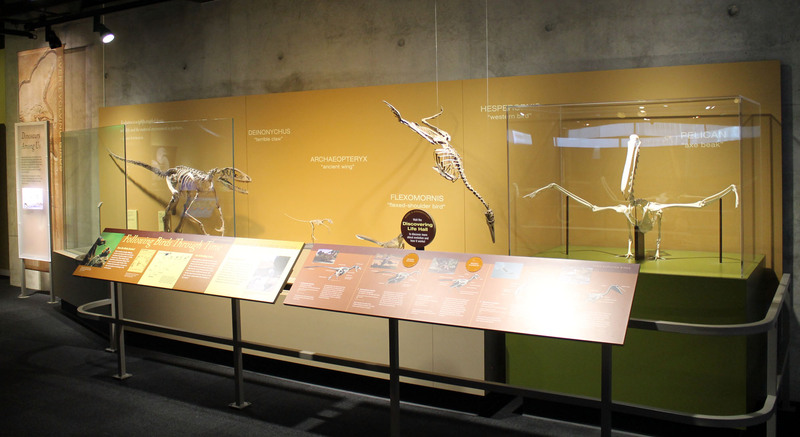 In addition to the cases of as-yet unlabled invertebrates, plants, and other small fossils, the exhibit included several large reconstructions of prehistoric animals. 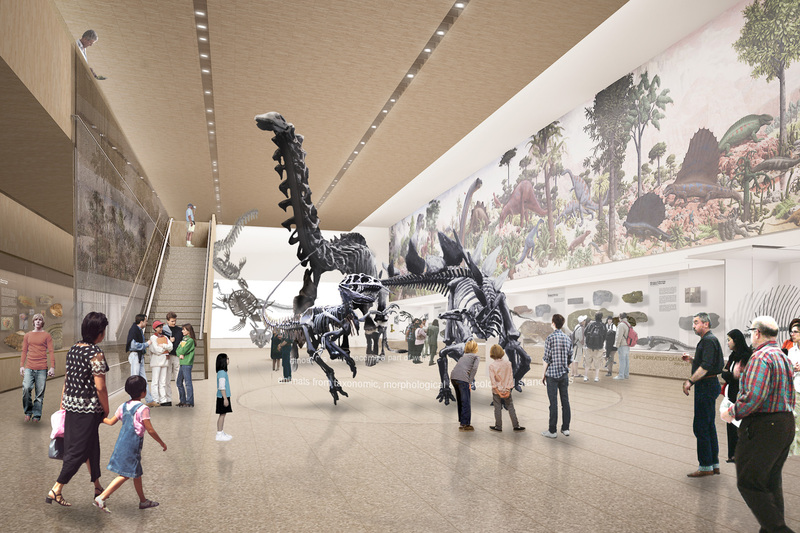 As of opening day, a life reconstruction of a mammoth stood in the west court, while skeletons of Megaloceros, Scistopleurum, Megatherium, Hadrosaurus, and a uintathere stood in halls 35 and 36. With the exception of the Megaloceros, these were all replicas of mounts from other institutions. The Hadrosaurus in particular was woefully outdated, considered by contemporary scholars to have “long since ceased to have any value except as a historic attempt” (Beecher 1901). After completing his catalog of the earth science collections in 1896, Farrington continued to lobby for a dedicated staff paleontologist. The board paid no attention until 1897, when the American Museum of Natural History and the Carnegie Museum of Natural History announced ambitious plans to scour the western interior for fossils. So began what Brinkman calls the second Jurassic dinosaur rush – a frenzied race among leading American museums to be the first to collect and mount a sauropod dinosaur. Not wanting to be left behind by peer institutions, the trustees approved the conditional hiring of Elmer Riggs to collect dinosaurs for the Field Museum. 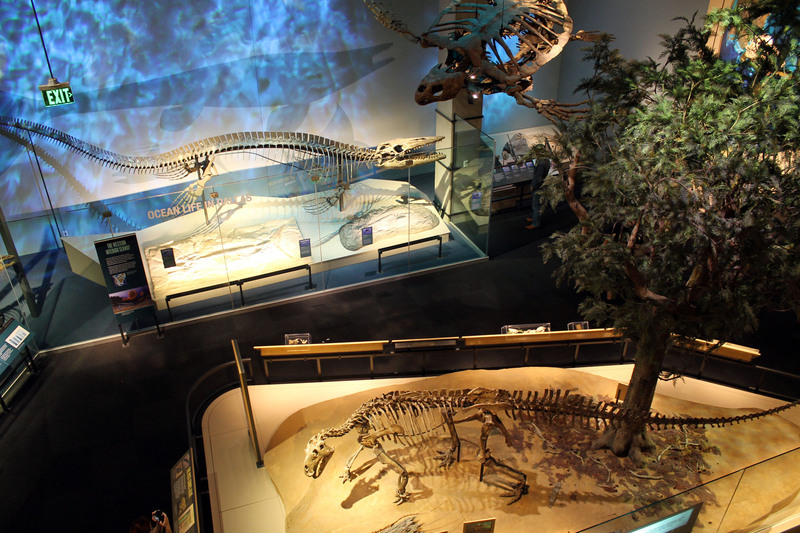 Hadrosaurus stands among other fossil casts in the Field Columbian Museum. Image courtesy of the Field Museum Photo Archives. Riggs and his classmate Barnum Brown cut their teeth in paleontology while studying under Samuel Wendell Williston at the University of Kansas. The two young men took part in an AMNH collecting expedition in 1896. 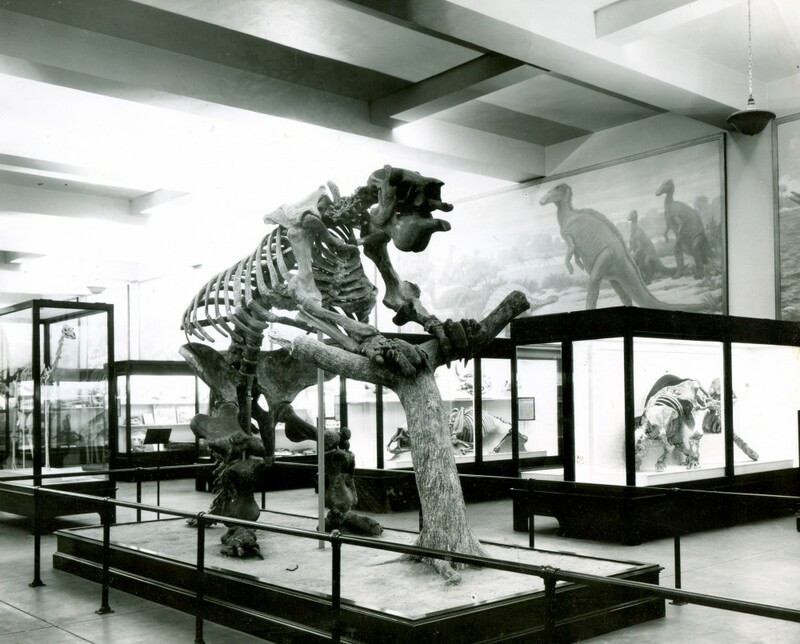 Brown, who had quit his studies to work for the museum, quickly became a favorite at AMNH. Concerned about his own future, Riggs sent an unsolicited letter to Frederick Skiff, offering his skills as a fossil collector and preparator. The letter crossed Skiff’s desk at an opportune time, and in the summer of 1898 Riggs was paid a small stipend for a trial collecting trip with Farrington. The expedition was a success, and Riggs was hired as an Assistant Curator before the end of the year. 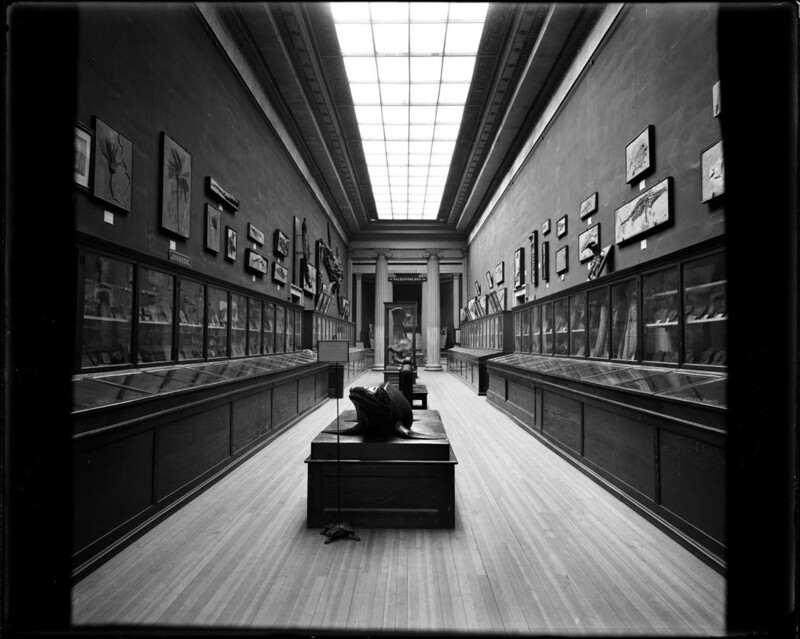 Riggs’ first three collecting seasons with the Field Museum were enormously successful. In addition to the holotype of Brachiosaurus, at the time the largest known dinosaur, Riggs collected a very-well-preserved back end of an Apatosaurus near Fruita, Colorado. 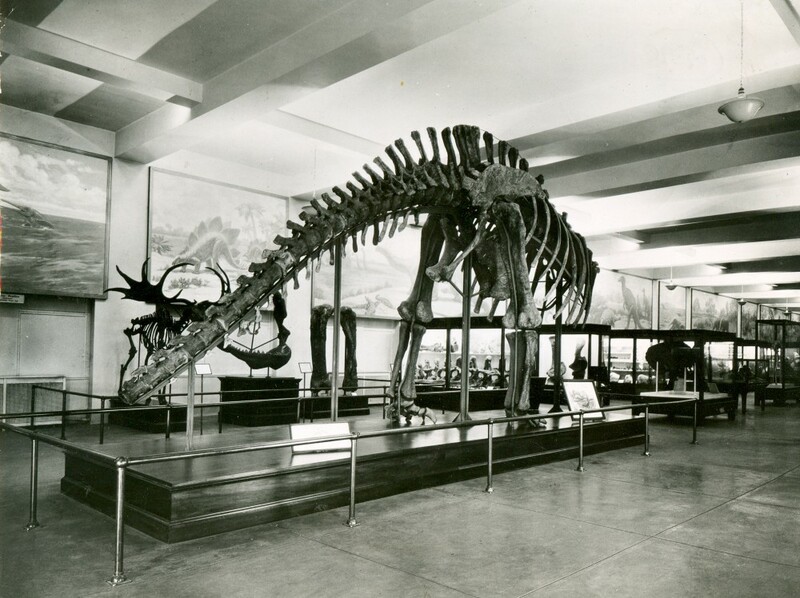 Nevertheless, AMNH won the sauropod race when they completed their composite “Brontosaurus” mount in 1905. 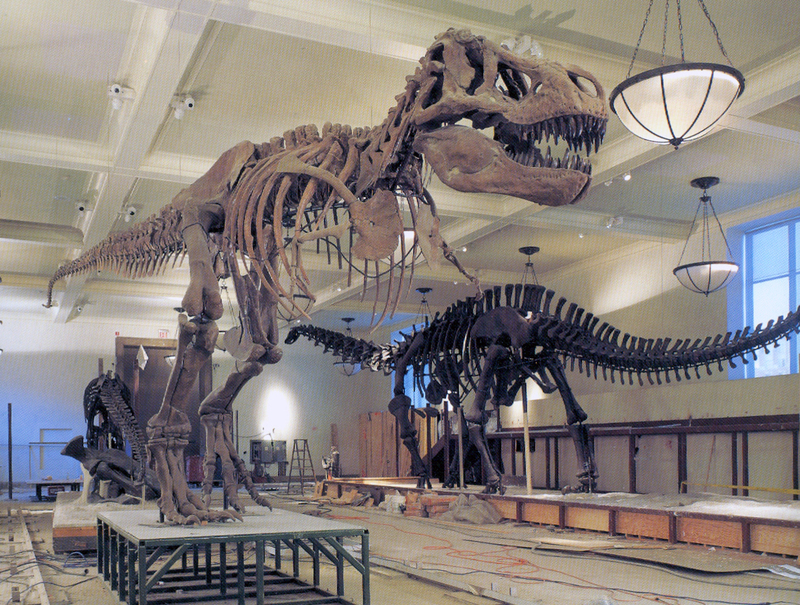 The Carnegie Museum had a Diplodocus on display in 1907, and was busy cranking out casts for European heads of state. While Riggs’ Apatosaurus was more complete than any single specimen the other museums had recovered, it was still only half a dinosaur. Riggs and Farrington repeatedly lobbied the board for funding to find more sauropod material with which to complete the skeleton, but the trustees had moved on to other things. Riggs’ Apatosaurus mount stood unfinished from 1908-1958. Image courtesy of the Field Museum Photo Archives. Plans were afoot to move the Field Museum to a new lakefront campus. However, when legal issues halted progress on the new building, Riggs was granted permission to mount the partial Apatosaurus in hall 35. The plaster casts previously displayed in this space were discarded, and unfortunately are now lost to history. A gas furnace was installed on the museum grounds, which Riggs and his small team used to shape massive steel I-beams for use in the armature. 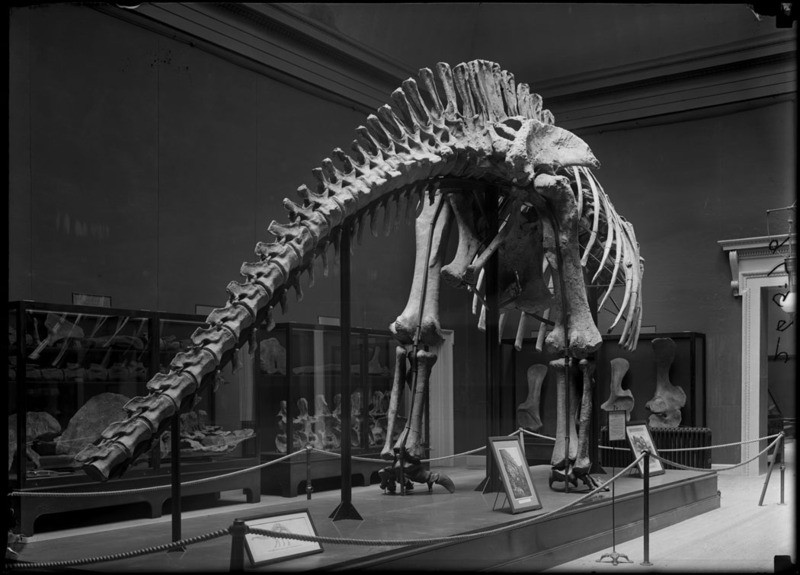 The teetering sauropod hindquarters was unveiled in 1908, but if Riggs hoped that the museum administrators would want to complete the mount once they saw how absurd the incomplete skeleton looked, he was out of luck. Indeed, the years that followed were among the most frustrating of Riggs’ career. He received no funding to collect fossils after 1910, and could only look on enviously at the thriving paleontology research and exhibit programs at AMNH and the Carnegie Museum. The institutions in New York and Pittsburgh were headed by paleontologists, and bankrolled by wealthy fossil enthusiasts like J.P. Morgan and Andrew Carnegie. By comparison, the Field Museum was controlled by trustees with seemingly little interest in paleontology. Already paid less than the museum’s other curators, Farrington and Riggs were left with meager resources and little to do until the 1920s. The Palace of Fine Arts was intended to last six months, and after ten years it was in dire shape. The roof leaked constantly, putting exhibits and collections in danger, and fences had to be placed around the perimeter to protect visitors from falling brick. Before his death in 1906, Marshall Field worked with architect Daniel Burnham to design a new home for the museum. It took years to settle disputes over where to place the building, but ground was eventually broken off Lake Shore Drive in 1915. Completed in 1920, the new Field Museum of Natural History was a gleaming marble fortress, decorated inside and out with intricate neoclassical reliefs and statuary. Exhibits and collections were transported by rail car, often without being removed from their display cases. Earth science exhibits found a new home on the west side of the upper level. 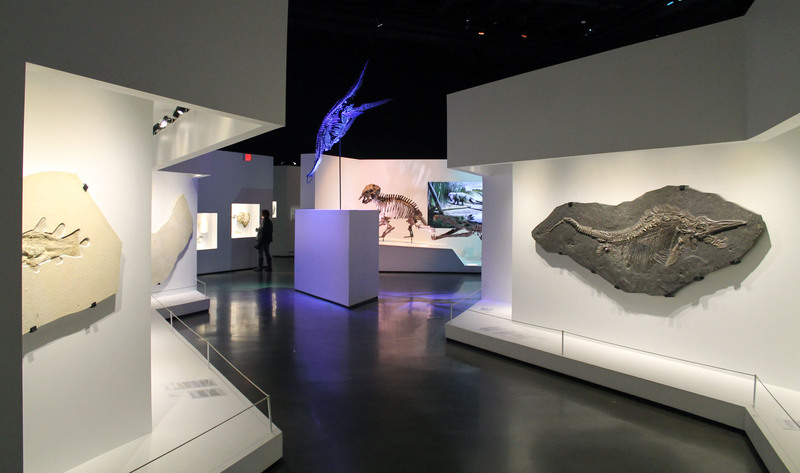 Hall 37, an east-west facing gallery accessible directly off the west mezzanine, housed invertebrate and plant fossils. Hall 38, running north to south against the far west side of the building, contained vertebrate fossils. 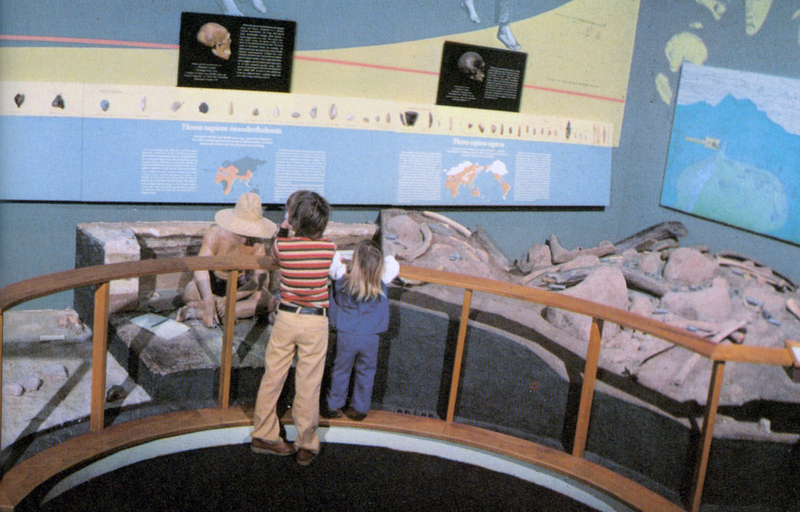 Although it was colloquially known as the “dinosaur hall”, this space never contained many dinosaurs. In the 1920s, the only dinosaurs to be found were the half-Apatosaurus, a Triceratops skull, an articulated “Morosaurus” (Camarasaurus) limb, and parts of Brachiosaurus. The bulk of the specimens on display were Cenozoic mammals, including horses, rhinos, camelids, and a mammoth and mastodon. There was also a life-sized “coal swamp” diorama behind a glass barrier, with large model insects suspended in flight. This comparatively modest exhibit was expanded significantly between 1922 and 1927, when Elmer Riggs was once again able to collect fossils in the field. Thanks to a bequest from Marshall Field’s grandson, Riggs traveled to Alberta, Argentina, and Bolivia, securing many unique specimens along the way. These included several new species, like the marsupial cat Thylacosmilus and the predatory bird Andalgalornis. A colossal Megatherium Riggs recovered in Argentina was immediately mounted for display, and became one of the most memorable elements of Hall 38. A postcard of the partial Apatosaurus at the south end of Hall 38. Image courtesy of the Field Museum Photo Archives. Megatherium at the north end of Hall 38. Image courtesy of the Field Museum Photo Archives. Hall 38 also boasted a spectacular set of murals by Charles Knight. The undisputed master of paleontological reconstructions and wildlife art, Knight had a long working relationship with Henry Osborn, president of AMNH. Osborn had commissioned Knight to create many large and small paintings for his museum’s fossil exhibits, but the two frequently argued over Knight’s remuneration. For years, Osborn and Knight discussed a series of immense wall canvases illustrating the entire history of life. 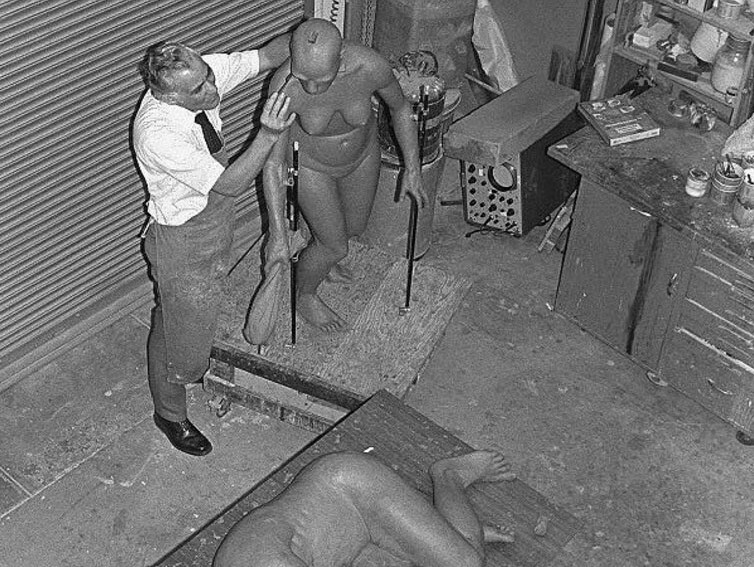 Osborn could never get the money together, however, and Knight refused to produce any concept sketches for fear that they would be turned over to a less-skilled artist. In 1926, the Field Museum’s board of trustees asked for a meeting with Knight about an identical project for their new fossil hall. The initial discussion did not go well, and Knight walked out when the trustees started making “suggestions” about the content, color, and composition of the proposed artwork. Knight was very talented, but also very particular. He gladly accepted anatomical expertise from scientists but would not suffer meddling with the artistic aspects of his work. Fortunately for both parties, Knight’s daughter/manager Lucy intervened, securing her father the biggest commission of his career. Knight completed 28 murals for the Field Museum, the largest of them measuring 25 feet long and nine feet high. Subjects ranged from the Proterozoic primordial soup to an iconic standoff between Tyrannosaurus and Triceratops. These images were not only painstakingly researched reconstructions based on the latest fossil evidence, they were (and still are) gorgeous works of art in their own right. 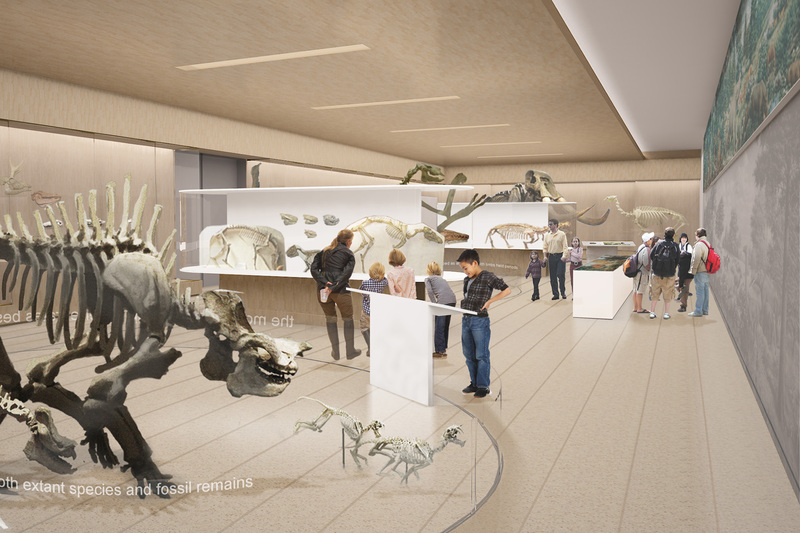 With Knight’s murals in place, the Field Museum finally had a world-class paleontology exhibit. The mastodon in Hall 38, with fossil horses visible beyond. Image courtesy of the Field Museum Photo Archives. 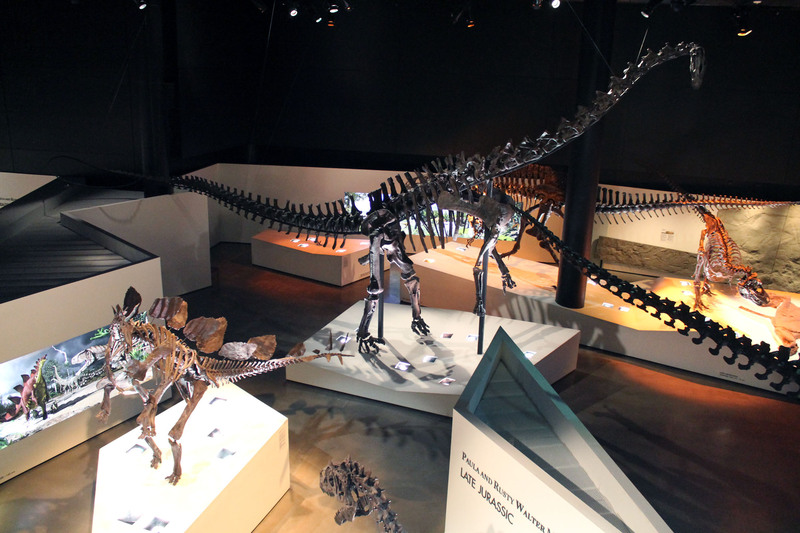 “Gorgosaurus” in the Stanley Field Hall. 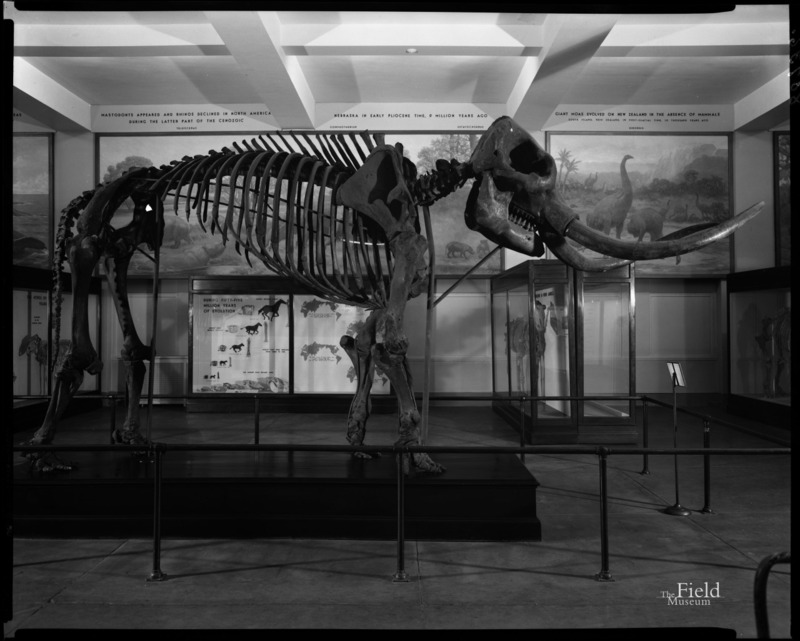 Photo courtesy of Field Museum Photo Archives. Riggs retired in 1942, leaving paleontology at the Field Museum to the next generation, among them Eugene Richardson, Brian Patterson, and Orville Gilpin. In 1951, Richardson oversaw a thorough modernization of Hall 37. 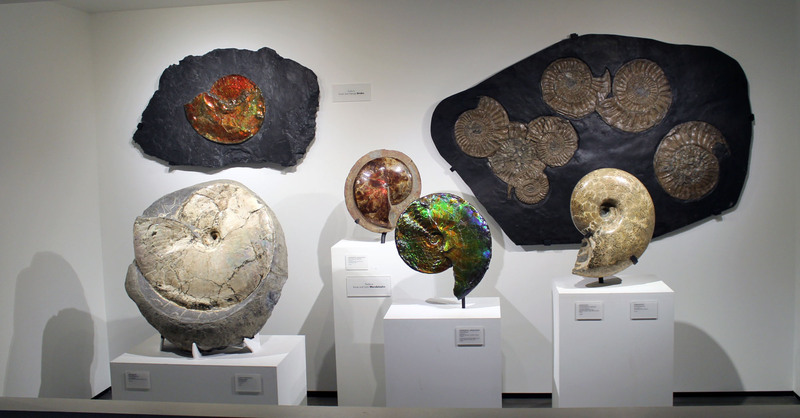 The number of specimens on display was drastically reduced, making room for more accessible explanations of the fossils and ten new dioramas of Paleozoic marine life. 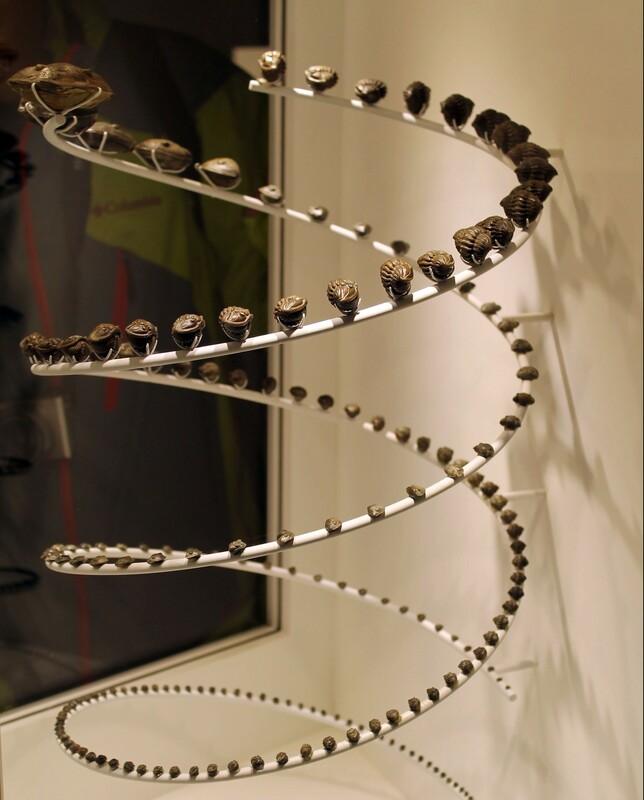 The resulting exhibit was one of the most comprehensive displays of fossil invertebrates in the world. 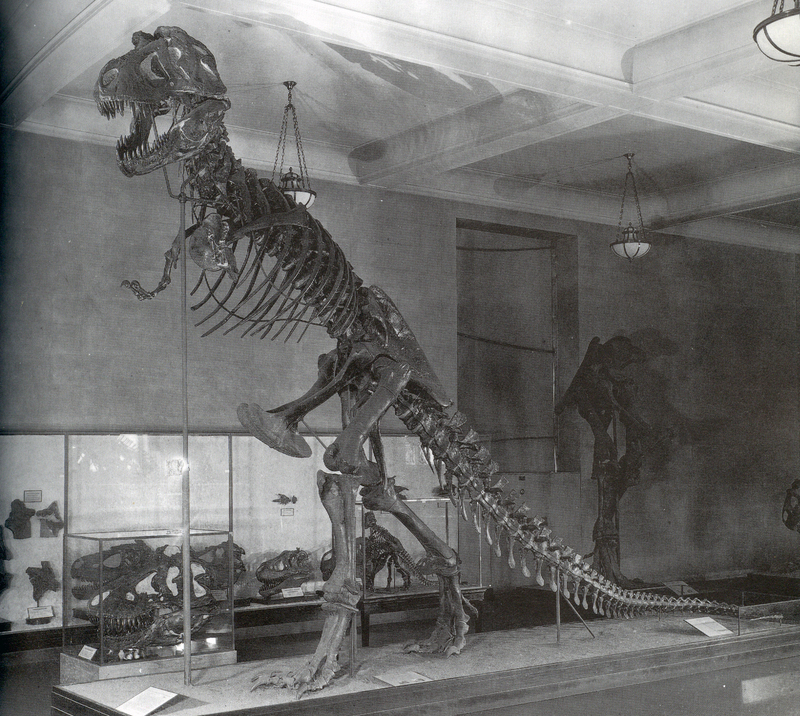 Although virtually no dinosaur research was done at the Field Museum between 1910 and the late 1990s, the 1950s saw the acquisition of two significant specimens for the benefit of the visiting public. In 1956, preparator Orville Gilpin assembled a Daspletosaurus (then called Gorgosaurus) for the central Stanley Field Hall. The skeleton was a surplus specimen from Barnum Brown’s years collecting along Alberta’s Red Deer River, and trustee Louis Ware spearheaded the effort to buy it from AMNH. Since the Daspletosaurus was acquired explicitly for display, Gilpin opted to skewer and otherwise permanently damage many of bones for the sake of an unobstructed, free-standing mount. In the mid 20th century, dinosaur fossils were thought of as display pieces first, and irreplaceable specimens second. Two years after installing the Daspletosaurus, Gilpin finally completed Riggs’ partial Apatosaurus in Hall 38. When Edward Holt announced that he had discovered the front half of a sauropod near Green River, Utah, the Field Museum purchased the rights to excavate and display the find. 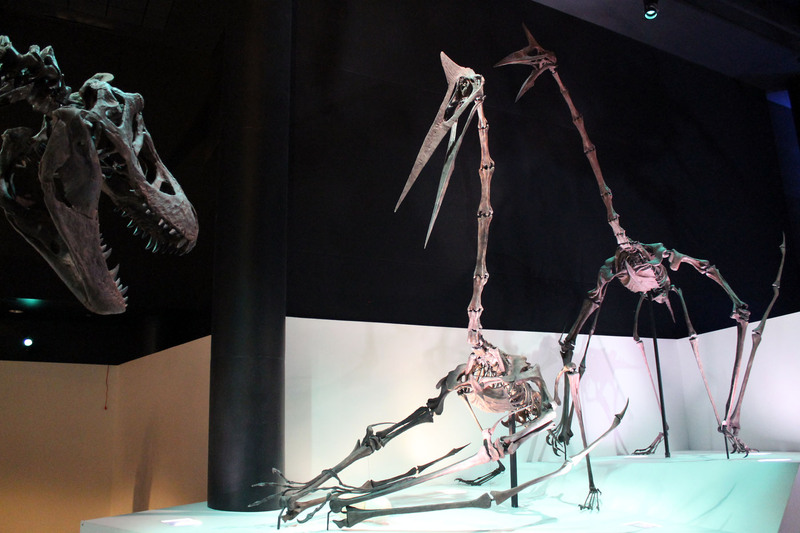 Gilpin added the new fossils to the existing mount without dismantling Riggs’ heavy-duty armature. 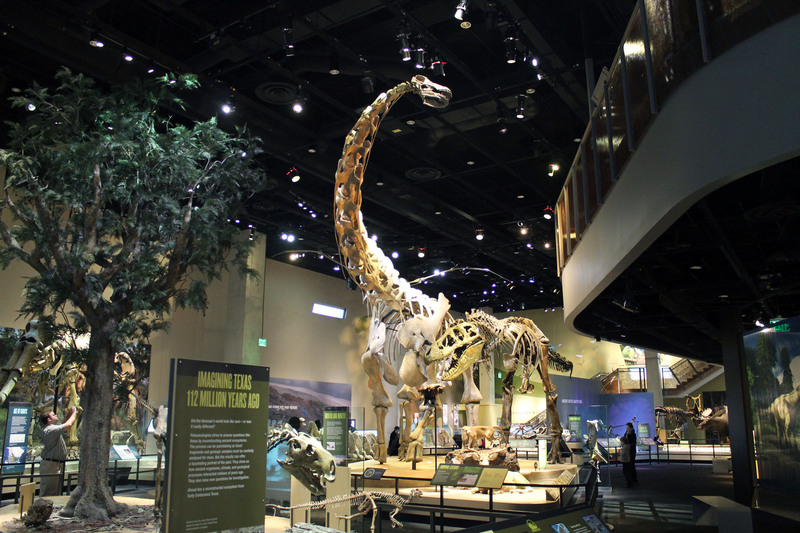 Relabeled “Brontosaurus” and erroneously given a casted Camarasaurus skull, the refreshed sauropod debuted in April 1958 – half a century after Riggs started the project. 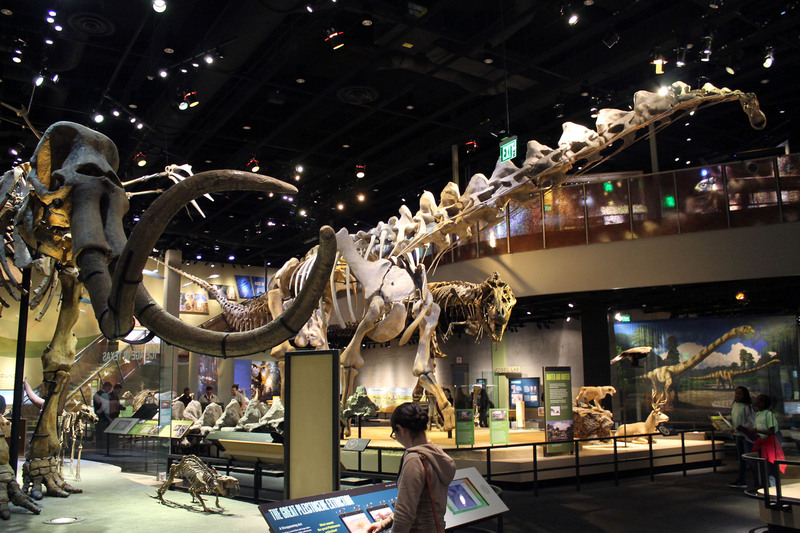 The next three decades saw occasional piecemeal additions to the fossil halls. For example, the University of Chicago donated its entire geology collection to the Field Museum in 1965. 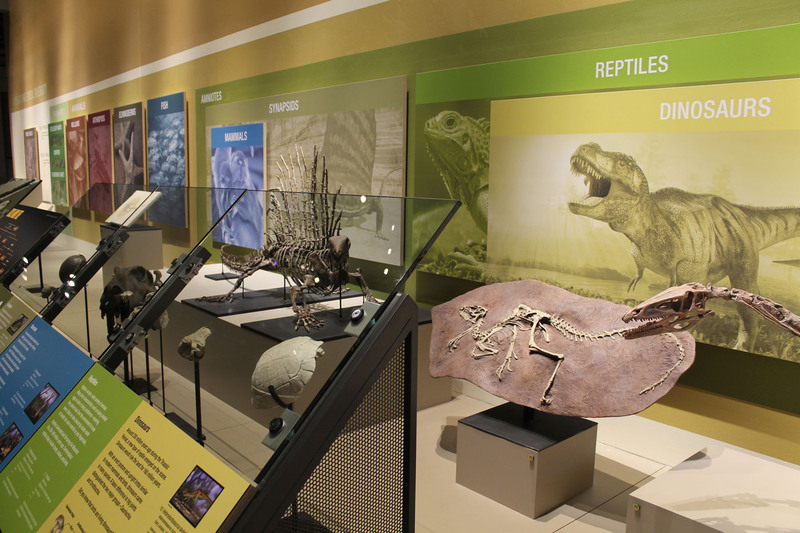 This included a unique assortment of Permian amphibians and synapsids from the red beds of central Texas, many of them holotypes. Field Museum preparators remounted several of these specimens and integrated them into the exhibits. Nevertheless, Hall 38 never received a complete overhaul, and by the late 1980s it was quite dated. Not only were the fossil mounts in stiff, tail-dragging poses, but the stilted label copy written by curators past did not meet modern expectations for natural history exhibits. Even the vibrant Charles Knight murals looked tired behind years of accumulated dust and dirt. 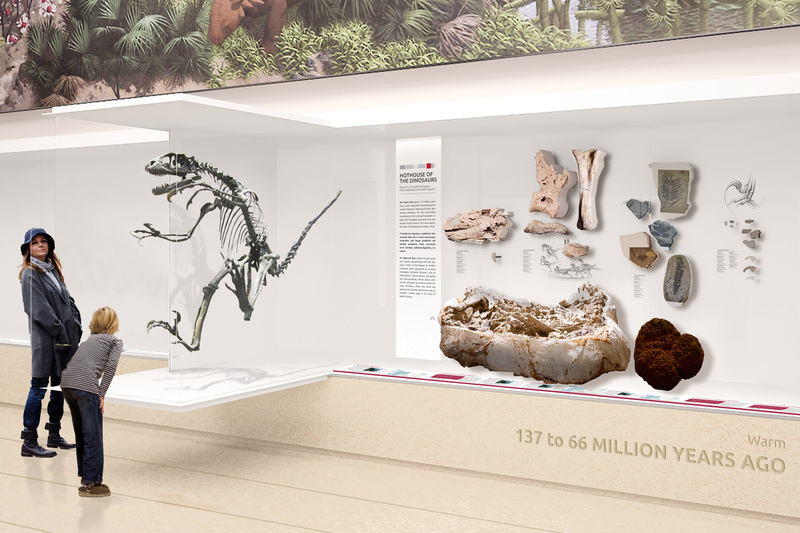 In short, the Field Museum was long overdue for a total re-imaging of its paleontology displays. Next time, we’ll take a look at the Field Museum’s fossil exhibits from the 1990s onward. Stay tuned! Beecher, C.E. 1901. The reconstruction of a Cretaceous dinosaur, Claosaurus annectens Marsh. Transactions of the Connecticut Academy of Arts and Sciences. 11: 311-324. Brinkman, P.D. 2000. 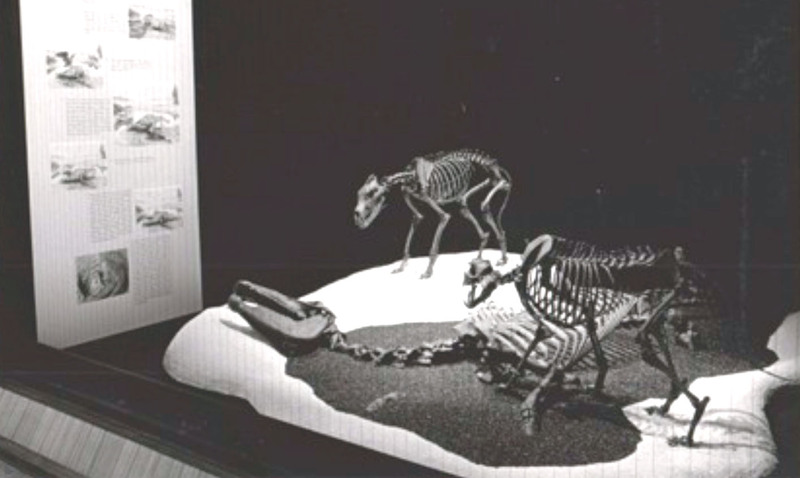 Establishing Vertebrate Paleontology at Chicago’s Field Colombian Museum: 1893-1898. Archives of Natural History 27: 1: 81-114. Brinkman, P.D. 2o10. 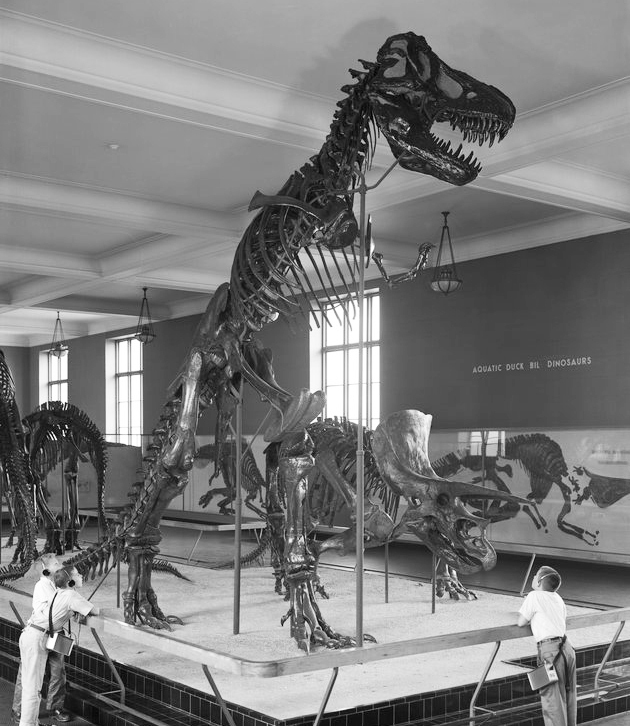 The Second Jurassic Dinosaur Rush: Museums and Paleontology in America at the Turn of the 20th Century. Chicago, IL: The University of Chicago Press. Chicago Natural History Museum Bulletin. (March 1956). 27: 3. Gilpin, O.L. 1959. A Freestanding Mount of Gorgosaurus. Curator 2: 2: 162-168. Williams, P.M. 1968. The Burham Plan and the Field Museum. Bulletin of the Field Museum of Natural History 39: 5: 8-12. 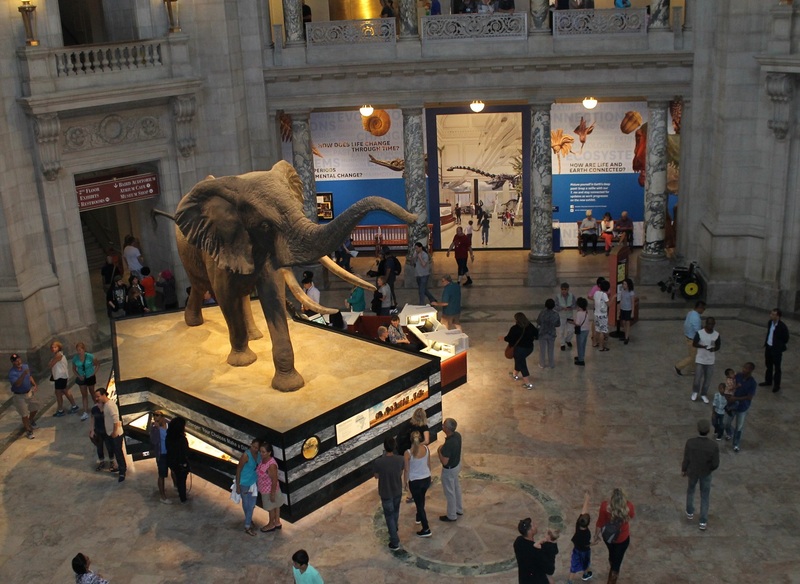 National Museum of Natural History rotunda, September 2014. Photo by the author. The iconic Fénykövi elephant, the centerpiece of the National Museum of Natural History rotunda since 1959, received an update last week in the form of a new interpretive platform. Like the Barosaurus at the American Museum of Natural History and Dippy the Diplodocus at London’s Natural History Museum, this African bush elephant is the first object most NMNH visitors see upon entering. With its ears forward and its trunk raised, the elephant stands over 13 feet tall – larger than any elephant known to be living today. 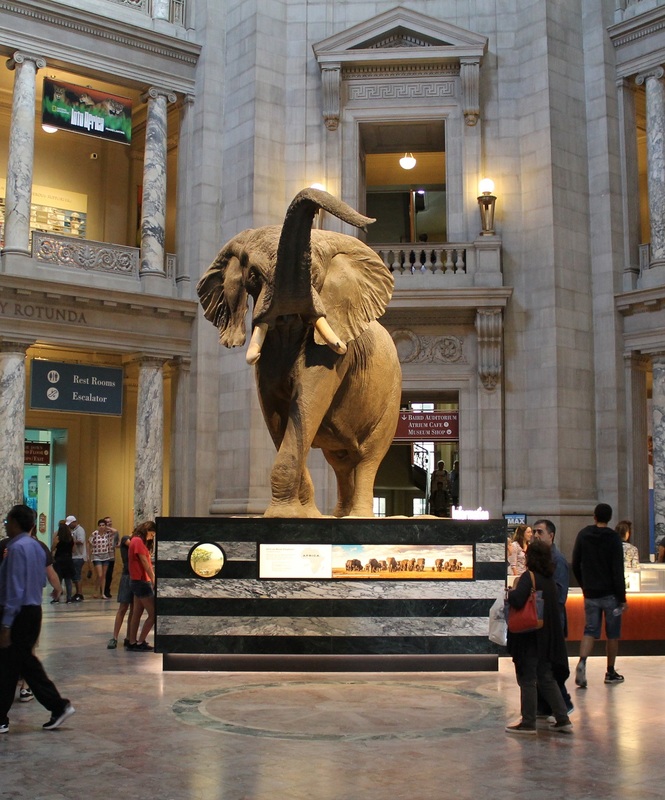 But in spite of it’s inspiring presence as the symbol of the museum, this elephant has a problematic history that NMNH has long struggled to interpret. Hungarian-born Josef J. Fénykövi shot the elephant in Angola in 1955. Fénykövi owned a ranch in the west African nation (at the time a Portuguese colony), and would spend several months each year there hunting wildlife. After discovering the existence of an unusually large bull elephant in 1954, Fénykövi returned the following year equipped to track and kill what was thought to be the biggest land animal on the planet. Fénykövi and his team of guides located the giant elephant on November 13th, and eventually downed it after a full-day chase*. A truck filled with salt was required to keep the hide fresh during the hundred-mile journey from the kill site to the nearest train station in Kuito. Rather than keep the trophy for himself, Fénykövi decided to donate the animal to a museum. He offered it to the London Natural History Museum first, but the process was taking too long for his taste so he gave the elephant to the Smithsonian, instead. Later, an old-fashioned slug from a flintlock pistol found embedded in the elephant’s leg provided reason to believe the animal had been nearly 100 years old when Fénykövi killed it. *Fénykövi’s account gives the impression that the guides did most of the work. They tracked the elephant’s prints and spoor on foot while Fénykövi followed in a jeep, and a man named Mario fired the shots that actually finished off the animal. The acquisition and subsequent exhibition of the Fénykövi elephant at NMNH gives us a great deal to unpack. The collection of animals for public display has fallen sharply out of favor over the past century. In the late 1800s, little worlds behind glass populated by taxidermy animals provided the increasingly urban public a window into the natural world they felt they had left behind. But even in Fénykövi’s day, popular opinion was beginning to turn against the practice. For most, this aversion to taxidermy begins and ends with the unpleasantness of being confronted with a dead animal. Some scholars rightly call attention to the imperialism and exoticism inherent in collecting animals from far-flung lands. This criticism is especially apt for Fénykövi – his story contains more than a whiff of imperialist entitlement. The Fénykövi Elephant in the 1960s. Photo courtesy of the Smithsonian Institution Archives. The fact that the elephant was killed as a trophy complicates matters still further. It’s one thing for a museum to display an animal that was sacrificed for science – to better understand its biology or to contribute to a record of biodiversity. Displaying a trophy is quite another. 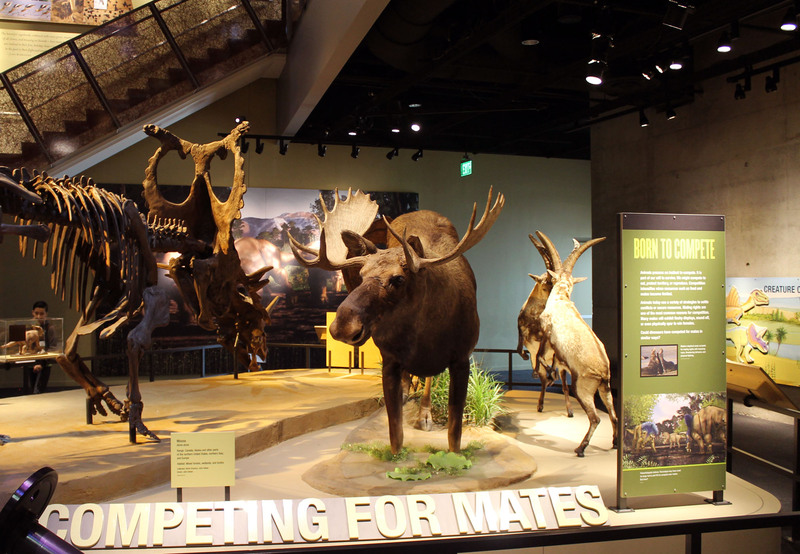 While a typical museum taxidermy display represents the life of an animal, a trophy mount celebrates that animal’s death. As Poliquin explains, “trophies arouse negative reactions not simply because they are evidence that a human killed an animal…they are evidence of a human’s desire to kill an animal” (Poliquin 2010, 152). Indeed, it is arguably impossible to fully separate a trophy mount from the narrative of the creature’s demise. For Fénykövi, the meaning of the elephant is obvious. It represented a specific, triumphant event in his life, an attempt to communicate something about himself through the death of animal. NMNH staff have faced the much greater challenge of interpreting Fénykövi’s trophy for the millions of visitors that enter the rotunda every year. For 56 years, they have struggled to present this animal, selfishly killed by a wealthy colonial, in a way that matched the museum’s conservation-oriented mission. The elephant’s original context unfortunately left something to be desired. 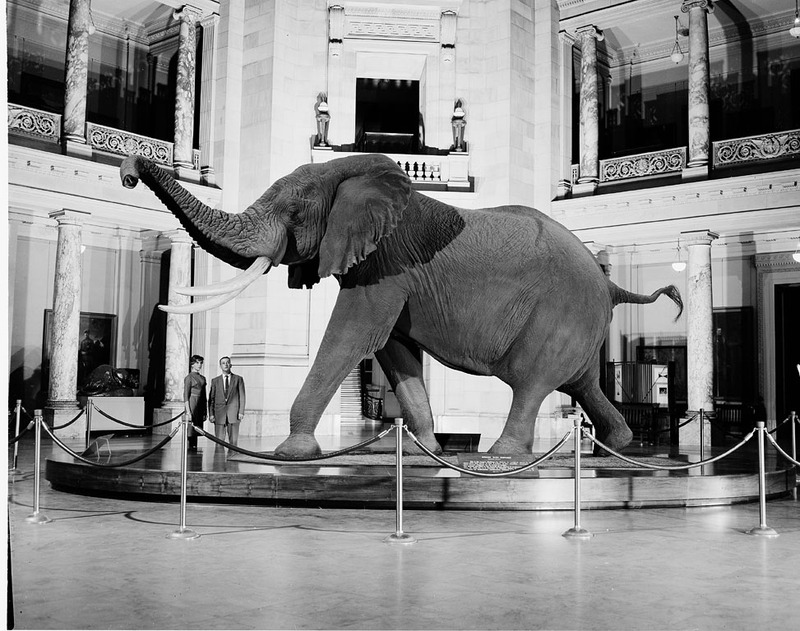 The traditional, circular pedestal in the center of the NMNH rotunda did not effectively distance the specimen from it’s origin as a trophy, and the museum was occasionally criticized for complicity with big-game hunting and the colonial agenda. Nevertheless, the elephant did eventually earn an identity as a symbol for the museum, largely separate from the man who killed it. Credit for this accomplishment goes to William Brown and Norman Deaton, who prepared and mounted the hide over sixteen months. Brown and Deaton managed to imbue this dead skin over a wood-and-plaster frame with an astonishing amount of life and character. The elephant holds court in the four-story rotunda, exuding confidence and power over it’s domain. It’s an unforgettable sight, and it almost makes one forget that this animal is only there because it lost a fight. Still, it was clear by the 1990s that while the elephant was there to stay, it needed to be more thoughtfully contextualized. 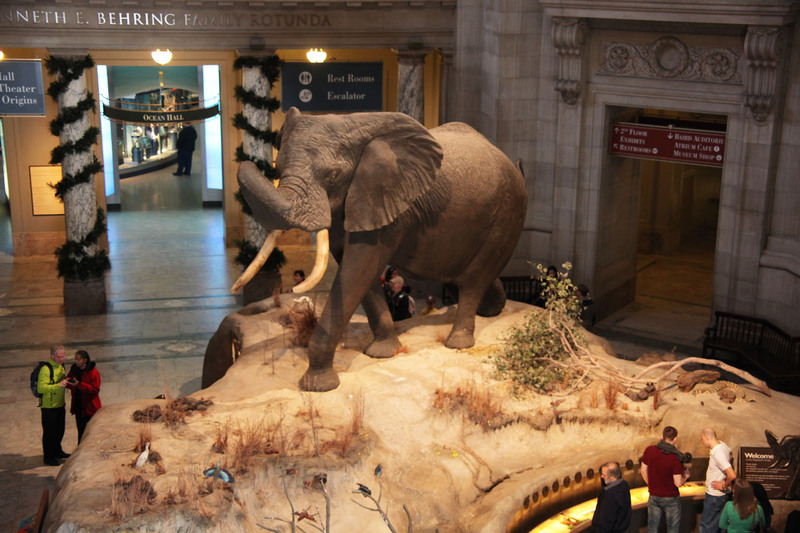 In 1999, NMNH replaced the old pedestal with a large, open diorama of the Angolan savanna, which brought the elephant three feet higher off the ground. The project was completed entirely by in-house staff, and was funded in part by a donation from Kenneth Behring (a big-game hunter, among other things). In the revised display, the elephant was the focal point of a story that encompassed every department at the museum. A jackal and an assortment of birds (a lilac-breasted roller, a carmine bee eater, and a white-backed vulture) joined the elephant on the platform, while Angolan grasses and trees completed the scene. Ants, flies, and dung beetles (pushing dung balls cast from examples collected at the National Zoo) abounded. A tin can allegedly tied to a tree by a local herder represented Anthropology, and bones of the extinct proboscidian Palaeoloxodon recki covered Paleobiology. In short, this display elegantly introduced visitors to everything the museum has to offer, while reinforcing the breadth and significance of natural history collections. The elephant’s platform has now been rebuilt once again. The elephant stands at the same height and at the same angle, but the footprint of the base has been cut back significantly. The savanna diorama is gone, replaced with a straight-edged marble pedestal. Light and dark marble stripes nicely reflect the rotunda’s classic architecture, particularly the columns in front of each of the main halls. The compass rose on the rotunda floor, hidden since the elephant was first installed in 1959, is visible once again. It grounds the elephant display nicely, especially when viewed from the second floor. Finally, the new elephant platform now includes an information desk. It seems sensible to incorporate a bit of functionality into the display, and fortunately this addition does not noticeably detract from exhibit’s overall aesthetics. The Fénykövi elephant from above. Photo by the author. The interdisciplinary interpretation has been removed*, replaced by displays that focus almost entirely on elephant behavior and the omnipresent threat of poaching. In fact, the only objects on display besides the elephant itself are three ivory sculptures that were seized by customs. The inclusion of these sculptures is a little strange, since it reinforces that ivory products are actually very pretty. Hopefully the adjacent message that elephant poaching has tripled since 1998 – and that an elephant is killed for its tusks every 15 minutes – will be enough to convince visitors that it isn’t worth it. *The one exception is a graphic that places modern elephants in their evolutionary and temporal context, featuring nearly photo-real artwork by Mauricio Anton. To its credit, the new display banishes Fénykövi from the elephant’s story – I didn’t see his name mentioned once. While I don’t think it’s possible (or more to the point, appropriate) to completely erase this specimen’s problematic history, it’s encouraging that it has taken on a second life as a cherished ambassador for its threatened species. I can think of no better outcome for an animal that was killed as a trophy. What do you think of the new display? Which version do you like best? Love, S. (1997). Curators as Agents of Change: An Insect Zoo for the Nineties. Exhibiting Dilemmas: Issues of Representation at the Smithsonian. Washington, DC: Smithsonian Institution Press. Poliquin, R. (2010). The Breathless Zoo: Taxidermy and the Cultures of Longing. University Park, PA: Pennsylvania State University Press.